﻿ Useful Information - Sail In Ionio, Sailing in Lefkada. Best prices in Lefkada island.Sail In Ionio, Sailing in Lefkada. Best prices in Lefkada island. Our yachts accommodate between six and eight people, meaning there’s plenty of space for everyone, above and below deck and is a dream to sail. All cabins on board are spacious doubles with en-suite facilities and are individually accessed from the saloon. BLUE MARLIN and BEBELA are both available for bareboat charter or skippered charter where an experienced skipper is on board and responsible for the sailing and mooring of the yacht. Once you have decided that you would like to join one of our sailing cruises, you can check for available dates. Please feel free to make your request. We will email you with more specific information about the date that you are interested in. When you decide to sail in Ionian Sea, the best point of arrival is Preveza Airport. This is just a short taxi ride (20 mins) to Lefkada and our yachts. We arrange your transfer from Preveza Airport to our yachts and back, free of charge. 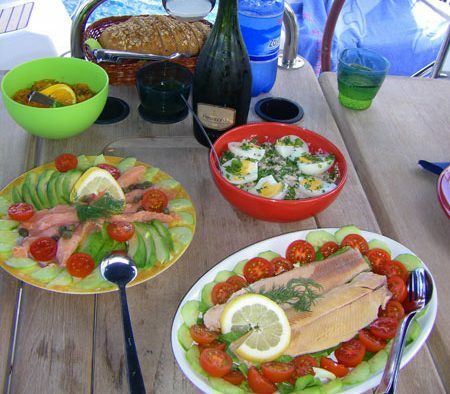 The sample menus, enclose, will give you a taste of the style of meals we serve when on board our yachts.